Jana Hodúrová shared a post to the group: КИЯНКА. I am glad to have spent some time around the cathedral while visiting Paris last October at the end of a tour of French carpentry museums, and I have good reason to be hopeful about the future of this building. The fire is a catastrophe, but the skills and passion to rebuild this structure are present in the compagnon craftspeople of France like in no other western country. The traditional knowledge that originally built this monument is still alive. The Compagnons du Devoir actively transmit this knowledge to young people through intensive, long-term apprenticeships, setting a high standard against which to measure any vocational training. There is hardly a more well-documented building anywhere in the world, and traditional craft knowledge can fill the gaps of any architectural survey. It’s easy to lose sight of history, including architectural history, as an evolving process. While some parts of Notre Dame are over 800 years old, and built upon prior ruins, its famed spire was designed by Viollet le Duc and completed in 1859, over 30 years after Victor Hugo wrote The Hunchback. At least one of the massive rose windows was replaced in the 1960’s. Maintenance is a necessary and continuous process tying the past to the present, ensuring a future for history, as the massive scaffold enveloping much of the cathedral recently attests. Shinto shrines in Japan are entirely rebuilt on a regular schedule, the Ise Grand Shrine every twenty years, 62 times. This is a radically different approach to maintenance than we are accustomed to here in the US or Europe, its critical function to train subsequent generations of craftspeople. The longevity of these shrines rises from the spirit and continuity of their creators and supporters, not from a faith in persistent materiality alone. A similar spirit brought members of the Timber Framers Guild together with international volunteers to create a replica of the Gwoździec synagogue in 2011. This structure now represents the lost wooden synagogues of Eastern Europe in the Museum of the History of Polish Jews, on the site of the Warsaw Ghetto. French culture, with the compagnons at the ready, is uniquely prepared to deal with the fire at Notre Dame, and to benefit from the audacity of its grand scale. Smaller reconstruction projects are always underway throughout the country, even to the extent of Guédelon, an experimental archaeology project to create a new 13th-century chateau. One of my greatest worries at the moment is that any efforts to rebuild the lost structure might be hampered by requirements to use modern materials, in a well-meaning but mistaken attempt to improve upon the original. I don’t think the original can be improved upon, and its soul would be lost in the attempt. Additionally, no modern materials have proven as durable as the original stone, wood, and lead, each of which can be maintained and repaired indefinitely. Buildings must inspire care to long persist, something no technology can replace. Far better for any reconstruction to be carried out in the full spirit of the original work, by committed craftspeople setting their efforts in search of the ineffable. Comrade: Alexandre Lepand who works as a roofer in France posted some photos from his personal collection of the notre dame roof up close.. Looks like it was cap-and-pan lead. What we lost… and why it matters. This image shows the construction of a typical French Gothic cathedral. The overcroft, the area above the vaulting (the ceiling you see when you look up) is an elaborate wood structure, often refereed to as a forest, supporting the roof. Some of those wood beams were over 100 meters long and dated to the 13th century. Heat reached 800 degrees C, destroying that forest and the roof. There is also extensive water damage. Most of the stone is still standing, but every piece of stone and all the mortar joints will need to be carefully assessed for heat damage. The stone vaulting did cave in at three locations; the crossing, which is the center under where the spire collapsed, and in the transepts. The three great rose windows appear to be intact; glass melts at about 1500 degrees C; but every piece of glass and all the lead caming holding it together will need to be examined. Art works are being moved to the Louvre for safe keeping. So far over €300 million has been pledged for restoration, but it will take much more than that to bring this world treasure back. Our hearts go out to France. I watch these demolition notices for historic structures in the west end of louisville go through my inbox every week. It’s hard to look at sometimes. This one is no exception. Super-cool shotgun, full brick. It’s slotted for demolition. A fully seamed window pan. Americans scratch their heads at this detail and resort to solder/sealant. Here, a guild-trained roof tailor handles the detail with ease: and permanence. and, blog of a blog.. crazy solution for huge pipe stack! Folks, it’s been a great weekend. Kirk picked me up on Friday. He’s building a garage and using salvaged slate for the roof and the siding. Over the weekend we started work on the roof together. First task was the drip edge. We made some origami corners for the drip and used “my” double lock clip system which give it a real old-world handmade kinda look while also being very easy to install. We don’t have copper yet so the pan-forming work will have to start next weekend. We are doing a 3′ snow apron in standing seam copper, and the roof will have 4 skylights so there is quite a lot of custom detailing to work on. The drip corner starts as a miss-shaped copper fortune cookie..
And then it’s nailed onto the corner and shaped in-place with an anvil and planishing hammers. No need to cut/miter the drip edge and the corner has a strong, one-piece gusset now that you can step on without it crushing. Template making and take-off for upcoming project. 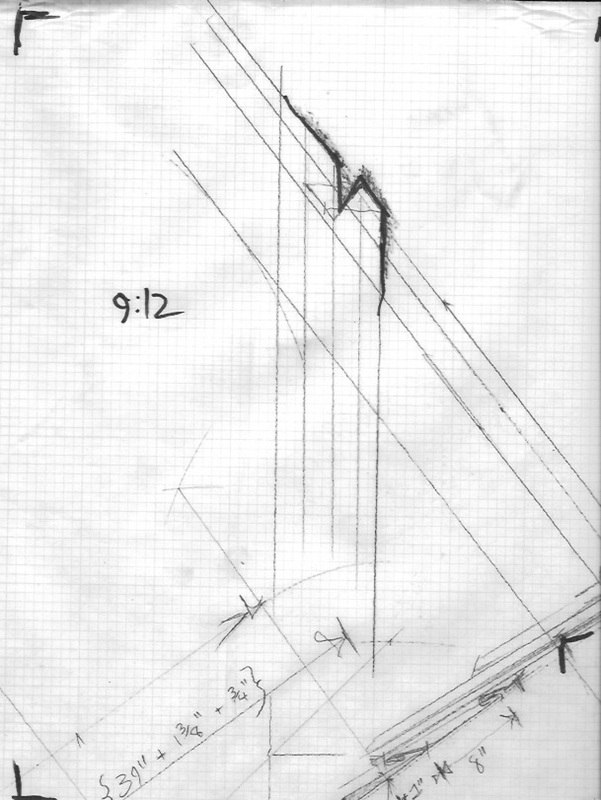 It’s a hip roof, 9:12. Starting with a geometry guide that will give me any angle I need to cut a pattern..